Directions: From downtown Ketchikan, 6 miles north on Tongass Hwy to Ward Cove. Right on Revilla Rd. for 6 miles. Right on Brown Mountain Rd. for 3 miles until dead-ends at trailhead. Approximately forty-minutes. Dude Mountain is one of my favorite hikes in Ketchikan and has actually become a traditional new-year hike for me, but not the usual January 1st New Year’s Day. For much of my adult life, as an undergraduate and graduate student and as a professor, many of my major life changes have often occurred at the beginning of the academic calendar year, which usually corresponds with the start of the fall semester in August or September. So, Dude Mountain has become my reset for each academic year, a way to officially transition from summer break into teaching again, a time for me to internally reflect on the positives and negatives of the previous year and to set my intentions for the upcoming year. I didn’t set out for Dude Mountain to become my new-year hike; it just sort of evolved into that. Perhaps because September is my favorite month for hiking in the Ketchikan alpine—the least amount of snow and bugs; the weather is generally a little cooler, and the days can often be sunny too. The drive out to the trailhead is one of the most scenic drives that Ketchikan has to offer. Starting from downtown Ketchikan, the drive can take about forty to fifty minutes to the trailhead. The second part of the drive is a blacktop road that turns into a dirt backroad through a mountain-rimmed valley that leads toward the interior of the island, where one can continue on to George Inlet or spoke off to Harriet Hunt Lake or up Brown Mountain Road, where the trailhead to Dude is. Brown Mountain Road is our only true twisty mountain road that climbs up into the high country vistas that is popular with weekend sightseers, hunters, wood and berry gatherers, and hikers. Brown Mountain Road dead-ends at the National Forest Service’s Dude Mountain trailhead. Squarely placed within the Tongass National Forest, Dude Mountain is one of the quickest ways, on foot, to reach the alpine tundra. From the trailhead, it is a 1.5 mile climb up 1500 feet. Depending on your pace, the climb can take up to two hours or more, one way. There is generally no cell-phone service (until the top and even then not always a guarantee), so it’s important to bring warm clothes, rain gear, flashlight, and food and water as the weather can change quickly in Alaska's mountain country. The trail starts out gravel and winds its way up to boardwalk through the lush rainforest and the beginning muskeg meadows above and then turns back into gravel in the alpine. The last part of the hike is steep and can be muddy in wetter weather or covered in snow depending on whether one is hiking in spring or late fall, so a trekking pole or two can be useful both on the ascent and descent. Once the big snows fall, Brown Mountain Road is only accessible by snowmobile. Usually June through the beginning of October offers a snow-free ascent. Just before the last part of the climb, the trail pops out onto a ridge between two valleys with clear views of John Mountain to the left and Brown Mountain on the right and the Pacific Ocean beyond if it isn’t cloudy. And of course one can see Dude Mountain’s summit right ahead. The ridge leads to the face of Dude Mountain, which is exposed and steep, but not considered a rock climb. Generally, with careful, slow placement of feet, one can ascend the rutted-out dirt path filled with rocky steps. Once you've traversed the face, follow the trail to the right and cut up and into the krumholtz to the summit proper. On this brief last stretch, beware of knee-deep mud holes. 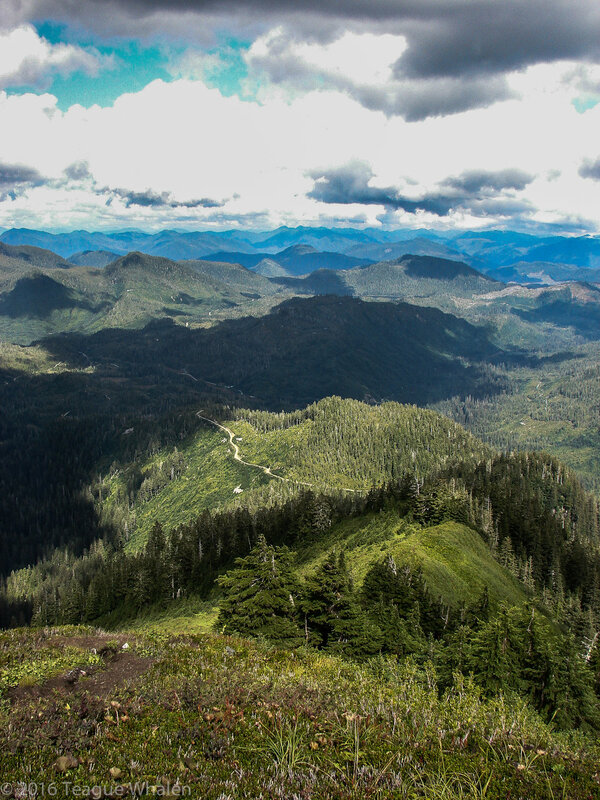 Soon you will find a small camp-sized clearing that overlooks Brown and Diane Mountains and the Inside Passage stretching to the north and west. However, I usually forgo the summit proper and instead find a perch in the alpine anywhere below and to the left of the krumholtz and enjoy the ridgeline of Diana Mountain to the right and the whole ridgeline to the left across the valley that houses Deer Mountain, Northbird Peak, and John Mountain. And of course the Dixon Entrance that floats beyond Annett Island and the Percy Islands into the unbroken skyline of thePacific Ocean. From here, experienced hikers and navigators can leave the trail and descend into the glacier-carved stone gap between Dude, Diana, and Brown mountains in order to explore Diana or Brown Mountains. I’ve seen goats and ptarmigan on this hike and have heard rumours about The Lady of the Mountain, a supposed two-foot tall brass statue that hikers like to look for and continually move around for the next hikers to search for. But for this hiker, I’m searching for silence and peace, so I like to choose a day when there aren’t any float planes buzzing around. One year, my then girlfriend and I hiked to the top and she received a phone call from her mother who lives in Florida, wishing her happy new year. Coincidentally it was also Rosh Hashanah, the Jewish New Year. After the phone call my girlfriend was very chatty with me, but I had to tell her to please be quiet, something amazing was happening. And then I was struck, as if a toneless bell, by the deep and profound silence of the ocean and the mountains stretching all the way into Canada. The land was speaking to me, and I connected so deeply that I was moved to tears because the moment was so beautiful and unexpected. Then out of nowhere, on this very still day, a little tornado of a wind whipped up right by me and disturbed a very small tarn before me as if there were a salmon about to breach and then the disturbance was gone. I may not have seen her yet, but that day, I was blessed and felt the presence of The Lady of Dude Mountain.